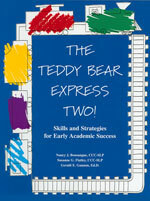 Each lesson focuses on a particular phonological process. Lessons are written for a small group of children (approximately five or six) but can be adapted for use in a classroom setting. Lessons can also be adapted for sessions with individual children. All lessons have been developed with regard to a young child's interest and natural environment. Sharing is encouraged to foster speech production practice and interaction. Songs and stories are chosen based on familiarity and appeal to young children, as well as how effectively they reinforce a particular concept. 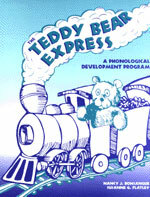 Included in each lesson are suggestions for songs and stories. 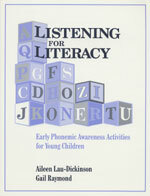 A word list is also included in each lesson for auditory stimulation. All the words on the word list contain the phoneme that was used to present the phonological process during that session.